A club for the LGBT (and the straight community) is thriving here at Pueblo Magnet High School this school year; the “I Am Me Project” has more than 20 members and supersedes the PRISM Club. A few teachers noticed that some students’ were struggling with personal frustrations. This is when Ms. Amy Kijewski (world history teacher) and Ms. Sarah Wilson (radio teacher) decided to sponsor the “I Am Me” Project. “I could tell this year that many kids were in desperate need of [an LGBT club], so it didn’t make sense to not be involved and initiate this club,” said Wilson. Although the “I Am Me” Project is less than a semester old, sponsors and club members have established many goals and objectives. They want to promote their new acronym, ASKE (Advocacy Support Knowledge Empowerment) as a way for students to feel comfortable and let them know that they have a safe place on campus. “One of our goals is to give students support and to educate the staff on how to deal with homophobia in the class room,” said Kijewski. Another goal for this project is to encourage these students to take control so it may be more of a student driven club, Kijewski. A way that this club is trying to promote themselves is by hosting the first ever high school Gay Pride Day. She added that a date has not been set, and no details have been ironed out yet, but it is the hope of club members and sponsors that this event occurs before the end of the school year. Club leaders and sponsors want the Pueblo community to know that all are welcome to attend future “I Am Me” meetings—regardless of a person’s sexual orientation. 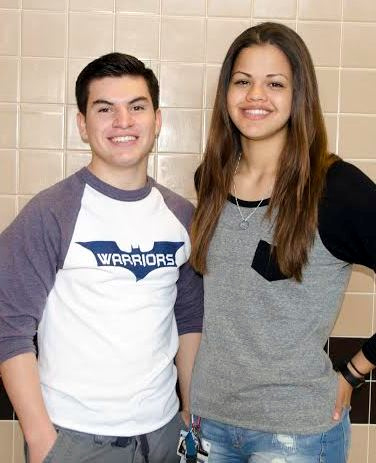 The “I Am Me” Project meets on Thursdays in Room 100 at 3:30 p.m.
My name is Daniel Lugo. I work for Child and Family Resources here in Tucson. I wanted to know if it was possible to meet with you and your students regarding “I AM ME PROJECT” at Pueblo High School. As a facilitator for the Teen Pregnancy Prevention, I want to know how the LGBTQ in our schools are or are not affected by sexual and reproductive health in our community. How they deal with a day to day basis task including social and at home life. Thank you for your time and hope to hear from you soon! Please email Imelda Cortez (imelda.cortez@tusd1.org), she is the Club Sponsor for IAMME Club for 2017-2018.